The years 1956-58 were pivotal in the further development of the modern surfboard – the board that Bob Simmons had primarily ushered in, along with the help of Joe Quigg. These were the years of experimentation with polyurethane foam as the primary floatation factor. The use of “foam“ and fiberglass would replace balsa and fiberglass; just like balsa had replaced redwood/balsa planks; just like redwood and balsa strip combination boards had replaced redwood which had replaced koa. The year 1957 was the last official year of the balsa era. Even so, it is good to keep in mind that much of the technological advance with foam and fiberglass occurred somewhat clandestinely while balsa still reigned. Sure, we can say that 1956-58 was the development of the polyurethane foam board. At the same time, we have to keep in mind that the rest of the tribe didn’t catch up to these changes until a year or two after it was a fait accompli – a done deal. That puts it more at the beginning of the 1960s than the end of the 1950s. Although foam did not immediately replace balsa, by late 1958 and 1959, it became evident to most of those on the inside that this was the way surfboard manufacturing was to go. Leaders in this new technology included Doug Sweet, Hobie Alter and Grubby Clark. No one knew, during 1957, that the year would mark the end of an era and that surfing would change radically because of foam. The primary technology on most minds that year might have been rocket and satellite science, as it was then that what was the U.S.S.R. -- the Soviet Union -- successfully launched Sputniks I and II, the first artificial earth satellites. The fact that the Communist Russians had done it first was threatening to the western democracies. By the time the year was over for surfers, the big news was Waimea. Since Dickie Cross‘s death there in 1943, there had been a voodoo associated with the place. Not to say that people no longer surfed the spot; just that those who did were few and far between. It took transplanted Californians like Greg Noll and Buzzy Trent to add Waimea to the list of big wave surf spots. It was in November of that year that the old spell was broken and a new one begun. Several of the Australian surfboard manufacturers wrote to companies in Equador in attempts to import the necessary balsa wood. “They were instructed to contact Arthur Milner,” wrote Nat Young, “who came to Sydney to discuss exactly what size timber was required for the expected boom. Business arrangements took a long time in those days and it wasn’t until the summer of ‘58 that their first shipment arrived.” The local shapers then began to learn the unique properties of balsa wood. “The lightest planks were the whitest,” continued Young, “with flecks of dark gray grain running through them; the hardest, but heaviest, were the greener, darker ones. Selection of the planks was an intricate part of the process; you used the lighter ones down the center, the heavier, more durable ones towards the rails. A scarf joint to give lift was the same as Simmons had devised 10 years earlier. As most of South America’s good quality balsa was going to the USA, Australia was sent some pretty scratchy shipments. By 1958 the established manufacturers had moved out of Sydney’s densely-populated eastern suburbs to the northside and the recently opened industrial suburb of Brookvale. At one end of Brookvale was Barry Bennett; at the other end, Gordon Woods; and in the middle, Bill Wallace. Bill Clymer was in a garage in Manly where he and Joe Larkin did some beautiful work, using stringers, nose blocks and tail blocks made from cedar and redwood to set off the blond balsa. What would become a surf music standard in the beginning of the 1960’s, 1957 produced a song by the Champs called “Tequila.” It is still often heard, today, on “the Oldies” radio stations. Dale Velzy introduced the “7-11“ series. Named for their length, these boards caused a minor sensation for a couple of years and then disappeared. Wetsuits were still under development, although dry suits had been available in kit form since after World War II. Bev Morgan is generally credited with first introducing surfing wetsuits via Buzzy Trent in 1953. Mike Doyle‘s first board was bought around 1956. “To be a La Jolla surfer in the ‘50s,” wrote Bruce Jenkins, “meant you never held back: in your drinking, your partying or especially your surfing, where the test of skill was a double-overhead day at Windansea. Nobody savored that life, or typified it more, than Patrick King Curren. “With the Mexican border beckoning,” continued Jenkins, “groups of them would go on blind-drunk Tijuana rages for days, waking up on some roadside without a clue where they were. Pranks and daredevil stunts were the very essence of their lives. “I named Velzyland when I first began making movies in ‘58,” Bruce Brown -- surfer and surf photographer -- said. “Velzy sponsored me and made my boards, so I named this spot on the North Shore after him. John Severson, who founded SURFER magazine, was also making movies at the time and named the same place, only used a different name. But Velzyland is the name that stuck. I also named Pipeline, and Severson came along and renamed it Banzai Beach. As a compromise, it became Banzai Pipeline. Now it’s Pipeline again. “In the fifties, the North Shore was a dream. It was all so new. And so cheap to live there. You’d find every way you could to stretch a hundred bucks. The deal was, who could get the cheapest house and get the most people in it? You could rent a house then for sixty to seventy dollars a month. With twelve guys sharing the rent, that hundred bucks went a long way. “It used to be,” Bruce Brown continued, “that all the guys who rode big waves were good watermen -- good swimmers, sailors or paddlers who knew the ocean, the currents tides. You could get into a lot of trouble, get sucked to the wrong side of Waimea Bay, if you didn’t know what you were doing. If you get caught in a rip at Sunset Beach you can almost do laps trying to get in. The rip runs along the beach, sucking you with it. If you know what you’re doing, you can aim your board out to the break and the rip will propel you out there towards it. “At Waimea, the surf would come up fast and make real serious sounds. I remember one night when it made the windows in our house rattle. That same night, the surf covered up the telephone poles with thirty feet of sand. This tells you Waimea is closing out. “A lot of people have surfed big waves once or twice, then ended up preferring smaller waves. Greg became such a dominant big-wave rider that I can’t even remember how he surfed little waves... even if no one had been buying boards or shooting pictures, Greg still would have been out there. 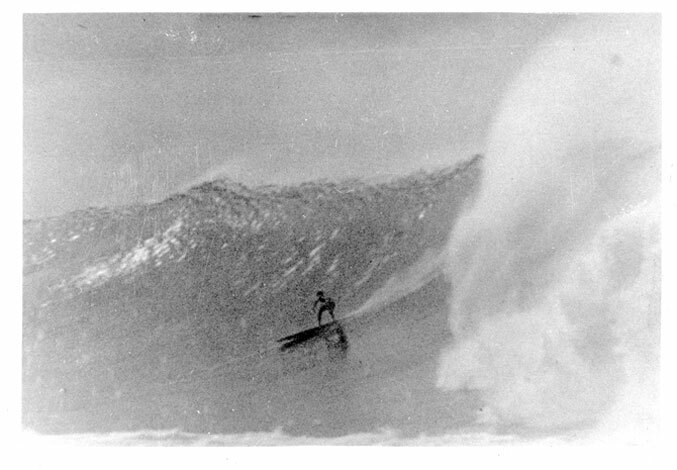 The same holds true today among big-wave riders. Their enthusiasm never dies. They’re eternally stoked. “... [big wave rider] Ken Bradshaw put it succinctly. A young kid came into Karen Gallagher‘s surf shop across from Kammie’s market and bragged to Bradshaw and others that he’d just ridden Waimea. Noll, Greg and Gabbard, Andrea. DA Bull: Life Over the Edge, ©1989 by Greg Noll and Andrea Gabbard, pp. 19-20. Mike Doyle quoted. Noll, 1989, pp. 77-78. Bruce Brown quoted. Bob Burnside was with them, but didn’t bring along a board, like the others had. See “Malibu Boards Seed Down Under,” in previous chapter. The Surfer’s Journal, Volume 1, Number 3, p. 43. C.R. Stecyk. Young, Nat. 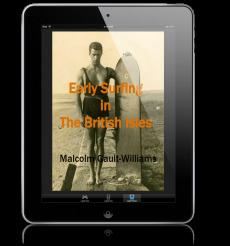 The History of Surfing, ©1983, 1987, Palm Beach Press, 40 Ocean Road, Palm Beach, NSW 2108, Australia, pp. 89-90. Other notable songs, although not linked with surf music, included, in order of popularity: “It’s All In The Game,” by Tommy Edwards; “To Know Him, Is To Love Him,” by the Teddy Bears; “It’s Only Make Believe,” Conway Twitty; “All I Have To Do Is Dream,” Everly Brothers; Nel Blu Di Pinto Di Blu,” Domenico Modugno; “The Purple People Eater,” Sheb Wooley; “Chantilly Lace,” Big Bopper; “Twilight Time,” Platters; “Topsy, Part 2,” Cozy Cole; “Lonesome Town,” Ricky Nelson; “Get A Job,” Silhouettes; “Tears On My Pillow,” Little Anthony & The Imperials; “My True Love,” Jack Scott; “(At) The End (Of A Rainbow),” Earl Grant; “Book of Love,” Monotones; “Kisses Sweeter Than Wine,” Jimmie Rodgers; “Secretly,” Jimmie Rodgers; “Whispering Bells,” Dell-Vikings; “Over The Mountain; Across The Sea,” Johnnie & Joe; “Young Blood,” Coasters; “Shangri-La,” Four Coins. The Surfer’s Journal, Volume 1, Number 3, p. 52. C.R. Stecyk. The Surfer’s Journal, Volume 1, Number 3. C.R. Stecyk. The Surfer’s Journal, Volume 1, Number 3. “Humaliwu,” by C.R. Stecyk. The Surfer’s Journal, Volume 1, Number 3. “Humaliwu,” by C.R. Stecyk, p. 49. The Surfer’s Journal, Volume 1, Number 3, pp. 46-47. C.R. Stecyk. Van Dyke, Fred. Thirty Years Riding the World’s Biggest Waves, ©1989 by Joseph Grassadonia, Ocean Sports International Publishing Group, Inc., 204 Poo-Poo Place, Kailua, Hawai`i 96734, p.31. Young, 1983, p. 79. See also Gault-Williams, “Pat Curren, King of the Bay,” Volume 2 of Legendary Surfers. Surfing magazine, August 1993, “Legend: Pat Curren,” interviewed by Steve Yarbrough, p. 34. Name spelling corrected. Jenkins, Bruce. “Father, Son, Holy Spirit,” Surfer magazine, Volume 36, Number 3, March 1995, p. 76. This section taken from “PAT CURREN: King of The Bay,” updated July 2011. Pezman, Steve. Email to Malcolm, May 10, 2011. This section taken from “PAT CURREN: King of The Bay,” updated July 2011. Van Dyke, 1989, pp. 84-85.